Secular holidays can be examined within a Jewish context, and, in many cases, also inform a person’s identity. 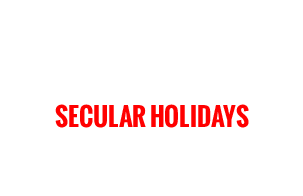 While holidays such as Thanksgiving, for example, may not be initially labeled as “religious,” there are elements to all secular holidays that can be likened to a religious observance. As such, when these holidays are celebrated and observed, connections can be made with Judaism. 6: How Do We Remember We Are Free?